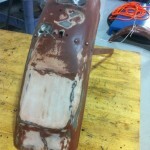 The rear fender had many extra drill holes and pitting due to rust after the sand blasting. The area around the license plate location was heavily damaged and had to be replaced. 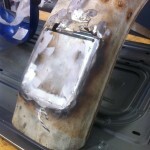 I acquired some sheet metal and used an ESAB C200i welder on the lowest setting to weld the replaced metal. 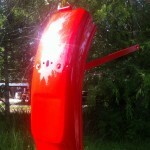 The metal of the fenders is a very low quality steel and it made it severely difficult to be able to weld. A lot of time and care was required to be able to achieve the desired result.